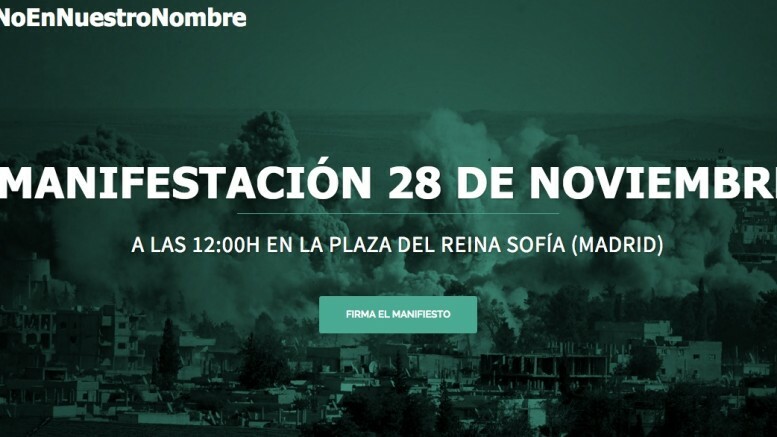 Anti-war activists in Spain, including left-of-center activist mayors and scores of entertainers and public personalities, have circulated an online petition and called for peaceful demonstrations on Nov. 28th in the country’s three largest cities to stem restrictions on civil liberties and escalation of aerial bombardments in Syria and Iraq in the wake of the Nov. 13th terrorist attacks in Paris. “Against terrorism, against Islamophobia and against their wars. Neither restricted liberties nor bombardments will bring us security and peace. Among signatories to the petition were the progressive activist mayors of alternative left mayors of Barcelona (Ada Colau), Zaragoza (Pedro Santiesteve), Cádiz (Jose María Gonzalez, Kichi) and La Coruña (Xulio Ferreiro), where peaceful protests will be held on Saturday. Other signatories included well-known Spanish actors, TV presenters, environmentalists, writers, activists, journalists and members of the 11-M organization, representing victims of the March 11, 2004 Madrid train bombings by Al Qaeda-linked terrorists, which killed 191 people and injured more than 1,800.